Mr. Enrique Florencio, Certified Sustainability Assurance Practitioner and currently the Knowledge Management Head of the Association of Development Financing Institutions in Asia and the Pacific (ADFIAP), served as the resource person. To further understand and manage its social media use effectively, the Western Mindanao State University (WMSU) actively participated in the Social Media for Development (SM4D) Seminar conducted by the Department of Information and Communications Technology Mindanao Cluster 1 (DICT-MC1) held last May 25-26, 2017 at the Grand Astoria Hotel. The two-day seminar was also designed to introduce social media, its origin and various applications in the development context to policy makers, government leaders, and communication officers who are looking into expanding their outreach and citizen engagement using social media. WMSU, represented by The Public Affairs Office (PAO), Management Information System & Technology Office (MISTO) and the Institute of Computer Studies (ICS) joined other participants from different government agencies and higher educational institutions (HEIs) in the region. Ma. Teresita Camba, DICT-IX Regional Director, recognized the partner-participants in the government’s aim towards improving the social media into becoming constructive platforms. “Social media has become part of our lives so it is important that we learn to serve our clients better through the use of social media,” said Dir. Camba. Mr. Enrique I. Florencio, Certified Sustainability Assurance Practitioner and currently the Knowledge Management Head of the Association of Development Financing Institutions in Asia and the Pacific (ADFIAP), served as the resource person. Several topics were discussed about social media including the different types of social media and its evolution; how social media is transforming society, its issues and concerns; effects of social media on the digital divide; and how to use social media as a development tool. 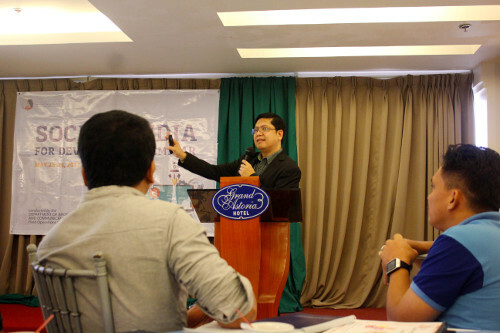 Mr. Florencio emphasized the importance improving the level of understanding and appreciation of the use of social media, especially that there has been a substantial change in the way people consume information and communicate since the proliferation of social media platforms in the last few years. It becomes customary for individuals nowadays to check multiple content sources throughout the day to stay informed, hence, it is significant that we adapt and evolve in order to stay ahead and cater to desired audiences. A workshop was also given wherein the participants were asked to draft a social media strategy based on the business model canvass for a specific program or project of the participants’ respective offices. The WMSU team presented a project on how to promote WMSU as the University of Choice by boosting its social media presence.